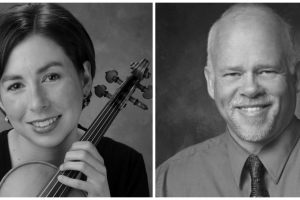 Professor of Music Jack Ballard recently released a recording, Chrystalin, with Akron Symphony Violinist Amy Glick. Downloads of the music are available at: https://store.cdbaby.com/cd/jackballardamyglick. Ballard enjoys collaborating with and learning from other artists. Chrystalin was inspired by the work of visual artist Robert Florzcak, whose work can be found at robertflorczak.com. "I was introduced to Robert Florzcak's art by a video online discussing modern art and how in his opinion it has sacrificed technique and beauty for the crass and shock value. His philosophy and mine are pretty close and I contacted him to say so," Ballard said. "I also found his website and several paintings inspired me to write him and ask for permission to write a musical suite for chamber orchestra." 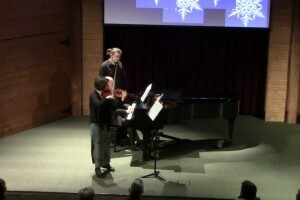 Ballard and Glick have worked together for several years and have performed a recital at Malone. They wanted to record some of their pieces as well as add Florzcak's suite, entitled "Four Seasons" and were able to finance the collaboration through a Malone University Summer Faculty Grant. "Florczak's style in these particular works evoked in me a sense of the fantastic, sometimes surreal (both artistically and figuratively) and a Kierkegaardian idea of aesthetics whose implications reach beyond the temporal," noted Ballard. "One perceives it in certain types of music, a redemptive film, a poignant ballet, the books of C.S. Lewis and fantasies of George MacDonald, and the art of Mr. Florczak." Visit Dr. Ballard's website at: kiwibirdcreativeservices.com/compositions or download their music at: https://store.cdbaby.com/cd/jackballardamyglick. Jack Ballard, professor of music, has composed, performed and produced music in a variety of genres, from classical and film music to jazz and bluegrass. He worked with Gunther Schuller, Wendell Jones, Arthur Post, David Maddux, and Frank Wiley, and received B.A.Ed and M.M. degrees from Central Washington and Eastern Washington Universities. His half-dissertation on hyperextended tertian sonority is from Kent State University. Its initial research received the Bruce Benward Student Music Theory Award in 2007. His ballet, The Castle for orchestra, received the Ipark Foundation’s Thanatopolis Prize for Memorial Composition for the movement, Lament, and in 2012 was the winner of GBE competition for his piece, Dances for solo violin. A selection from his oratorio, Incarnatus Dei won Honorable Mention with the Vanguard Premiers competition, and he is presently working on the fourth movement to his fifth symphony. He has released albums in instrumental and vocal jazz, bluegrass, and electronic music, and is working on an album in classical chamber music with violinist Amy Glick. As a Fulbright Scholar in African Music (Kenya, 2013), he wrote an evaluation of the Kenyan music industry and education, is a repeat evaluator for the Young African Leadership Initiative and the Fulbright Scholarship. His research interests include Spanish, African, and Irish music, and experiential education issues. Ballard currently teaches music production, ethnomusicology, and composition at Malone. Amy Glick performs actively as an orchestral player, chamber musician and soloist in Northeast Ohio. A member of Akron Symphony and Akron Baroque, she is a charter member of the Shenandoah Valley Bach Festival Orchestra, where she performs as assistant concertmaster. She has appeared as soloist with Akron Baroque, the Shenandoah Valley Bach Festival Orchestra, Tuscarawas Philharmonic, Wooster Symphony and the Akron Lyric Opera Chamber Orchestra, and has appeared in numerous chamber recitals in Ohio, New York, Louisiana, Virginia and West Virginia. A devoted teacher, Glick has served on the faculties of the Lucy Moses School for Music and Dance in New York City, the David Hochstein Memorial Music School, the Brevard Music Center, and Central Christian Schools. She has performed and recorded new music by Christian Hege and Jack Gallagher (College of Wooster. She studied chamber music with members of the American String Quartet and the Beaux Arts Trio, and her primary teachers include Burton Kaplan (Manhattan School of Music) and Camilla Wicks (Eastman School of Music). Glick lives in North Canton, Ohio, with her husband and four children.